CTL Congratulates the School Districts and Middle Schools Awarded Grants in the Nevada Ready 21 Digital Learning Program! CARSON CITY, Nev., March 2, 2016 — Twenty Nevada schools will receive $14.1 million from the Nevada Ready 21 (NR21) digital learning initiative announced today by the Nevada Department of Education. CTL, a manufacturer of 1:1 solutions for education, will provide Chromebooks, networking wireless infrastructure, a rich suite of apps and online tools and a robust package of service and support for this program. Learn More About Awarded Grants in Nevada! CTL understands the vision behind Nevada Ready 21 and has provided a robust and comprehensive solution designed to deliver on that vision. Nevada Ready 21 is an innovative program designed to provide students with an engaging, technology-rich education to include 1:1 computing. Learn More About Nevada Ready 21! 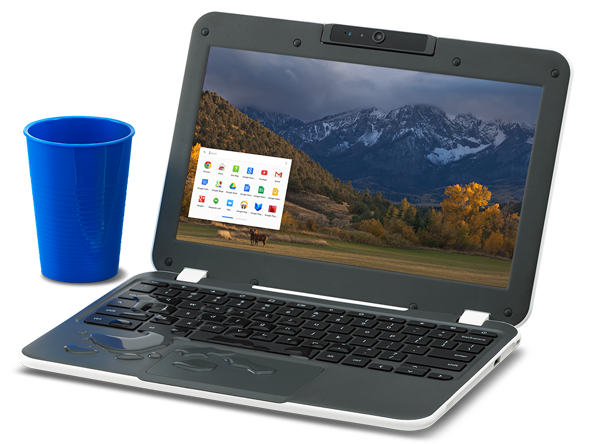 The CTL Education Chromebook NL6 is designed and purpose built specifically for use in demanding K-12 environments. Its rugged design is drop and water resistant and includes education-friendly features such as a retractable carry handle, keyboard keys that are resistant to removal and a quiet fan-less design that keeps dust away from electronics. A solution for installation, integration and ongoing maintenance in participating schools using Cisco enterprise grade hardware. CTL has teamed up with two of Ciscos top Nevada partners, Dyntek and Vision Technologies for installation, maintenance and support. A rich suite of apps and online tools to enable teaching to learning outcomes consistent with Nevada state standards. The software applications in CTL’s solution promote learning through exploration and interpretation. The learning environment is supported by tools to help teachers facilitate learning and IT protect students and manage technology. A comprehensive program to provide initial and ongoing education, leadership and technical professional development to every educator in the state through regular in-person and online workshops. 100% USA based support for students, teachers, administrators, and technical coordinators – provided in a variety of ways to best meet the needs of the user and to best resolve the incident. CTL provides a 2% buffer pool of spare devices to participating schools to ensure that there are always devices on-hand for students and teachers, even if their originally issued device is sent for repair. NcLab® - A Powerful and Fun way to Learn to Program. Google G-Suite for Education - easily create, share and edit files in real time. Google® G-Suite for Education is a suite of productivity tools for Classroom Collaboration. Google Apps for Education allows teachers and students to create, share and edit files in real time. Google Apps for Education core services include Gmail, Calendar, Docs, Sheets, Slides, Hangouts and Drive. Educators and students can use Google Apps for Education from any computer, tablet or phone, allowing them to work anywhere and anytime they want to. Desmos Graphing Calculator is an online graphing calculator for elementary through high school math. With a full collection of video tutorials and the Desmos Bingo graphing challenge game, Desmos provides a fun and easy way to learn mathematical concepts. Features include Derivatives, Functions, Graph Settings, Inequalities, Lists, Parametric Equations, Points, Polar Graphing, Regressions, Statistics, Tables, Trigonometry and more! WeVideo - easily create and share great-looking videos. WeVideo® is a unique cloud-based collaborative video editing service that helps people from all over the world simply create and share great-looking videos. The WeVideo editor is easy enough for first-time editors, and sophisticated enough to help students create a professional-looking video. Students and teachers can work together on the same video project, make changes, provide feedback, and explain their visual thinking during the creation process. Students have the ability to make creative decisions demonstrating understanding and mastery of concepts. Start with the simplified Storyboard editor and work up to the more advanced Timeline editor with video tutorials to guide you along the way. The WeVideo licence included in the CTL Nevada Ready 21 solution is a 'WeVideo for Education' subscription. This product is specifically developed for use by teachers and students in an educational setting. WeVideo for Education allows for student collaboration, teacher management of classes and projects, GAFE domain integration, and higher levels of security and privacy (a walled garden) than other WeVideo personal and business plans. You can learn more about WeVideo for Education here: https://www.wevideo.com/schools. LabCamera® by Intellisense allows students and teachers to conduct physics, biology and chemistry experiments by using the CTL NL6 Chromebook integrated camera and the LabCamera App. The Lab Camera application by Intellisence helps to promote scientific inquiry, helps make abstract concepts tangible for students and is an excellent complement to your STEM curriculum. Teachers can ignite imaginations and reveal the natural sciences using the Lab Camera application and the device’s built-in camera. Six modules are included: Time-Lapse Camera, Microscope, Pathfinder, Universal Logger, Kenematics and Motion Cam. Noteflight® is an online music writing application that lets students create, view, print and hear music notation with professional quality, right on their CTL NL6 Chromebook. Noteflight provides secondary educators and students with a private, secure online community. It’s perfect for group composition, repertoire sharing, and more. Noteflight is an entirely cloud-based notation software platform. You can view, edit, and comment on your students’ scores in an online environment. Create and save unlimited scores, compose directly from any MIDI device, and choose from 50+ high quality instrumental sounds. CTL's NR21 solution includes 'Noteflight Learn', a private website designed specifically for music education where all users have Noteflight Premium features, including recording, performance and assessment tools. Every user can access their Noteflight account from their Chromebook. All digital scores are interactive, customizable, and easily accessible, and sharing and collaboration are built directly into every aspect of Noteflight Learn. PocketLab® is a science lab that connects to the CTL NL6 Chromebook and fits in a pocket. PocketLab allows students to explore the world and build science experiments using integrated sensors including Accelerometer; Gyroscope; Magnetometer: Pressure and Temperature. PocketLab has many of the same features as lab equipment that costs thousands of dollars but is simple to use, deploy and manage and is included with the CTL NL6 Education Chromebook as part of CTL’s solution for NR21. Autodesk Pixlr® - a powerful, easy-to-use photo editing cloud-based app. Autodesk Pixlr® is a powerful, easy-to-use photo editing cloud-based app. Apply a quick fix and fine-tune any picture or add your personal touch with effects, overlays and borders. With over 100 effects, 340 overlays, and 200 borders, users can adjust the transparency, resize and rotate each element for unlimited photo creativity. Effects like crosshatch, halftone, and dapple can turn photos into a work of art with a single click. ArcGIS® Online - a complete, cloud-based mapping platform. ArcGIS® Online is a complete, cloud-based mapping platform. Make and share beautiful maps and do everything in between. ArcGIS Online is a scalable and secure software-as-a-service hosted by Esri. It’s designed for anyone, at anytime, on any device. Maps, apps, analytics, and collaboration are all part of ArcGIS Online’s sophisticated features. A suite of base maps, high-resolution imagery and the highest rated demographic data is included. Make 2D and 3D maps with the built-in map viewer and scene viewer. Google® Chrome Education - makes it easy for school IT administrators to deploy and manage users, devices and apps. Google® Chrome Education (formerly Chrome Management Console) makes it easy for school IT administrators to deploy and manage users, devices, and apps across a fleet of thousands of Chromebooks. Manage 10s, 100s and even 1000s of Chromebooks with ease. Assign devices to users and get configuration and usage reports, pre-install and block apps and apply policies, apps, and settings to different sets of users. Google Chrome Education makes it easy for users to get up and running while ensuring they’re protected by web filters and firewalls. Google® Classroom - helps teachers create and organize assignments. Google® Classroom Classroom is a new tool in Google Apps for Education that helps teachers create and organize assignments quickly, provide feedback efficiently, and easily communicate with their classes. Classroom helps students organize their work in Google Drive, complete and turn it in, and communicate directly with their teachers and peers. Classroom weaves together Google Docs, Drive and Gmail to help teachers create and collect assignments paperlessly. Teachers can make announcements, ask questions and comment with students in real time—improving communication inside and outside of class. Classroom automatically creates Drive folders for each assignment and for each student. Netop® VisionHelps teachers: monitor and redirect student use of technology; maximize instructional time; improve focus and comprehension. Helps IT staff: spend less time on teacher support; improve teacher and student use of technology; Google Classroom integration makes setup simple. Helps administrators: support effective instruction in 1:1 classrooms; ensure student safety; promote integration of technology into curriculum. Securly® Provides a safe and productive environment for student internet use. Simple Cloud Based Web Filtering with Granular K-12 Policy Management Delivered through the cloud, Securly provides both in-school and take-home filtering through the same admin console. Zero-touch filtering of 1:1 take home Chromebooks using a Chrome extension that takes seconds to deploy with no proxying and no SSL certificates. Securly is the first product to audit student posts on Facebook, Twitter and Google+. Securly also employs cutting edge natural language processing algorithms to flag activity on these networks that might be indicative of cyber-bullying or self-harm. Distribu-Q® When it comes to school-wide initiatives, educators spend a lot of time discussing the process and what to prepare in order to make the deployment of technology in schools as smooth as possible. A 1-to-1 laptop program deployment (also know as 1:1 initiative) is no different from others that schools are tackling recently. While it is a noble endeavor to pursue the smoothest laptop program deployment possible, our team at Administrative Software Solutions works very hard to lessen the burdens of the implementation. Our aim in doing so is to allow educators to spend more time doing what they do best, teach students on the proper use of the technology tools. Our research lead to the creation of a cloud-based software solution that takes away the burden of the distribution, repair tracking, communication to all stakeholders about the devices selected for the one-to-one laptop initiative, and dealing with disciplinary issues related to device mishandling and misuse. BrightBytes® Learning Outcomes BrightBytes Learning Outcomes is available to schools and districts participating in the NR21 program. Learning outcomes helps educators to confidently determine the most valuable methods to integrate technology. The Learning Outcomes module allows educators to discover which programs have the most impact, so conditions can be established, scaled, or adjusted, and resources can be allocated accordingly. GoGuardian® Admin provides district officials with the granular control and analytics they need to keep the internet as open as possible - but as safe as needed - to aid learning and keep students on-task without inhibiting exploration. GoGuardian® Teacher provides educators with the tools they need to manage classroom technology, guide their students towards the right information (at the right time), and encourage them along the way.